What happens when mirth turns to murder? When the screams are not from joy, but flesh-ripping pain? 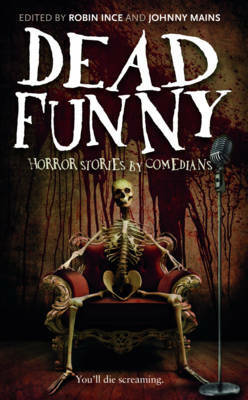 Dead Funny is an audacious anthology, featuring tales of terror from some of the brightest lights in UK comedy. Award winners Robin Ince and Johnny Mains team up for this unique exploration of the relationship between comedy and horror to see if they do, as believed, make the most comfortable of bedfellows. Johnny Mains is one of these people, his encyclopaedic knowledge and private collection of books and memorabilia is stunning. Seriously Johnny should lay on some catering and provide guided tours round his house. I get excited when I get a personalised book, this guy probably has the authors soul locked up in a mason jar in his cellar. Johnny Mains not only carries a flame for the old horrors, but wants to cause a bit of a conflagration of his own. It seems like a lifetime ago since I first heard about this book. I was lucky enough to be one of the first people in the know, and ever since then I have been intrigued, and excited. I loved the premise of the book, a load of comedians and stand up comics tackling my most beloved of genres. A brilliant concept, when you consider that in my opinion both horror and comedy come from the same dark pit in our minds and soul. Most of the tales explore damaged minds, whether it's Reece Shearsmith's dog-murdering boy, Mitch Benn's vengeful doctor or Matthew Holness's deranged puppeteer. On the whole, the better stories embrace the supernatural, such as the future-predicting diary in Katy Brand's "For Roger" and the siren-like women who lead a vulgar banker astray in Phill Jupitus's tale. The most experienced author here, Charlie Higson, fares best with his cheerily macabre story about an ageing horror-movie actor. Throughout, the book revels in the unsettling overlap between laughter and dread. The short, punchy tales each have their own distinctively scary flavour, kicking off with Reece Shearsmith's beautifully vicious-with-a-twist Dog, featuring some gory canine-based retribution. Other contributors include Mitch Benn, Neil Edmond, Matthew Holness, Rufus Hound, Tim Key, Phill Jupitus, Michael Legge and Al Murray. There is pretty much something for everyone here. I always suspected comedians were a pretty sick and twisted fraternity. Dead Funny confirms it and the book is all the better for it. This is not the result of some job-swapping reality TV show, this is the real thing, with veritable authors pulling many of the stops (and viscera) out to show their worth writing horror. And it's just as nasty as it could be - but in all the right ways. Dead Funny is hopefully the book that has the best chance of propelling horror fiction back into the face of the general public. It is a good thing that this book is of such high quality. This book is a treat to read as there are some fantastic tales from writers who are (mostly) new to the genre. If you want some smart, well written horror with a hint of mirth, I strongly encourage you to invest in a copy. Or else. As I have said before humour and horror are not always the perfect bedfellows, but each of the contributors to Dead Funny clearly show great affection for the genre that comes through in the writing. Don't expect all the stories to be a laugh a minute, some of them are pretty gruesome, though there are some tasty little gags to be found. I give Dead Funny a 666/666.